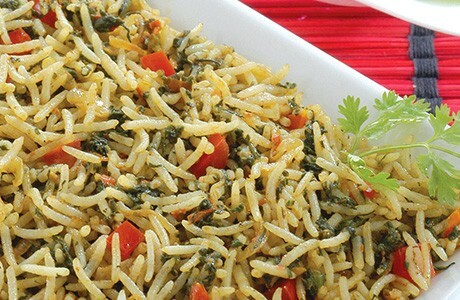 Light, fluffy basmati rice is cooked with onions, tomatoes and fresh spinach as well as a range of authentic aromatic spices. This dish makes a perfect accompaniment to be served alongside a hot raita or any lentil dish. Heat the oil in a heavy-bottomed pan; add the onions and sauté until brown. Add the drained rice and stir carefully to coat the rice grain with the oil. Add the tomatoes, cooked spinach, turmeric powder, coriander powder; cumin powder; and salt. Stir carefully to mix well and heat through. Add 3 cups water and bring to the boil. Cover the pan with a tight lid and reduce heat to very low, Continue to cook for 20-23 minutes. Remove cover and stir the rice gently. Continue to cook for another 7-10 minutes on very low heat. Remove and serve.